Tarte au Citron is definitely a favourite in our house, never lasting more than a day, the sharp lemon scent and flavour combines extremely well with the sweet pastry. Another great party dessert because you can happily make it the day before. And guess what? It freezes well too. Open freeze it, then wrap securely with foil and place back in the freezer. Let it thaw at room temperature for about 2 hours. It’s not difficult to make but it is a little time consuming; only because of the chilling time for the pastry. Afraid of pastry? Don’t be! There is no magic formula or secret to pastry making – it’s all a conspiracy by pastry chefs to make you think it’s more difficult than it actually is! Let’s face it, when you approach it with trepidation or negativity, you might as well admit defeat from the word GO! Remember the Little Engine? The pastry here is a sweet, soft, crumbly shortcrust, known as pate sucrée, so, you’ll want to handle it gently. Speed and temperature are crucial. Keep the flour and the sugar in the fridge to chill (30 minutes will do). I place my marble slab in the fridge too. Hey, if it takes you a few go’s to get it, that’s what it’s all about, right? Be liberal with the flour or icing sugar on your work surface and here’s a tip for the top of the pastry. Place some cling film on the surface of the pastry as you roll it out, don’t worry it’ll lose its clinginess very quickly because of the butter. This will help give the crumbly pastry a smooth surface and keep its integrity by not having too much flour added to it. The filling here is the sort you’ll find in many tarte au citrons or the less glamorously named Lemon Tarts! When you mix the lemon juice to the egg and cream custard base, the texture will change and thicken slightly, don’t panic, it’s supposed to. Another version of lemon tart is actually cooking the egg and cream mix to produce a proper custard, adding butter and then filling the case. One of these days, I’m going to make that one! 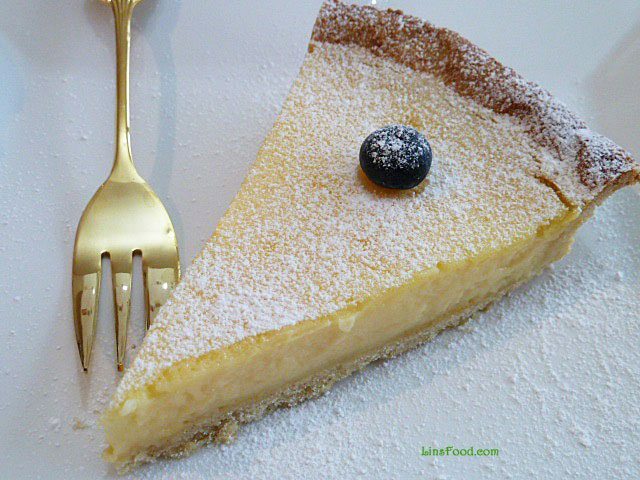 Tarte au Citron recipe, or lemon tart. Sharp lemon aroma and flavour in a homemade sweet pastry case. For the pastry, with a wooden spoon, beat butter and icing sugar till creamy, then beat in the egg till mixed. Add the flour and rub with fingertips till the mix resembles breadcrumbs. Add water, 1 Tbsp at a time as needed and lightly bring it all together. Knead it very slightly and gently to smooth it all out (do not overwork the pastry). Flatten it, wrap in clingfilm, and chill for 30 mins. 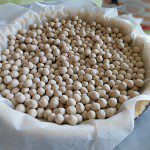 Lightly flour a work surface, a chilled marble or granite slab would be perfect, to keep the pastry cold. Roll the pastry out to about 2-3cm thickness. 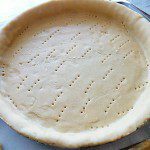 Lift the dough and place it in a 23cm (9 in) loose bottomed tart tin. This is easier done if you roll part of of the dough onto the rolling pin first and lift it up with the pin. Make sure the pastry is neatly tucked in all around. Long nails, be careful! 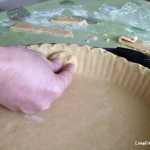 Cut off the overhanging pastry, leaving a slight hang for shrinkage if you want. Prick the pastry all over and chill again for 30 mins. I know this is time consuming but you can go off do stuff in that 30 mins, the result is so much better than shop bought, trust me! Turn oven on to 180˚/375˚F and place a baking sheet on the middle shelf. This is to ensure the bottom of the pastry cooks evenly too. After 30 mins, line pastry with baking paper, fill with beans/rice (ceramic baking beans are perfect) and bake on the hot baking sheet for about 12-15 mins. You need to check this as all ovens are different. Remove the baking paper and beans and bake for another 3 mins. Brush the pastry all over with the beaten egg yolk and bake again for 2 mins. this forms a seal & stops the bottom of the pastry getting soggy from the filling. Leave to cool for at least half an hour before removing from the tin. Remember hot pastry is soft. 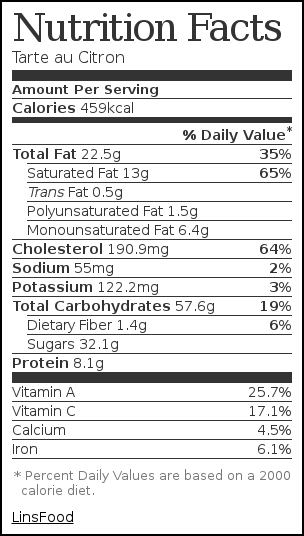 For the filling, turn oven up to190˚C/375˚F. This is the easy part! Gently hand whisk the eggs and sugar in a large bowl (over whisking will result in too many bubbles/foam, you don't want that). 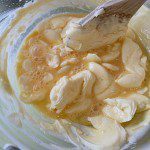 Add the cream, whisk, then add the lemon juice. Some people like to add lemon zest but I don't like bits in my tart! Carefully pour the mix into the case and bake for about 20-25 mins. Serve at room temperature, dusted with icing sugar. Total time does not include the hands off chilling time. It looks really delicious! I would like love to give a try to this recipe! I still remember eating a whole lotta tarte au citron in Paris….such sweet memories. Thanks for the tips, I can now make it myself! Simply Divine, and love your easy to understand instructions, too! Wow! Tarte au citron looks great, delicious! Lovely tarte au citron! I love all citrusy things and lemon tarts are some of my favourite. Thank you for your kind words, MJKIT!